Pumpkin spice is in the air and that means fall is coming fast. Yes I will admit the whole pumpkin spice trend seems to start earlier every year! 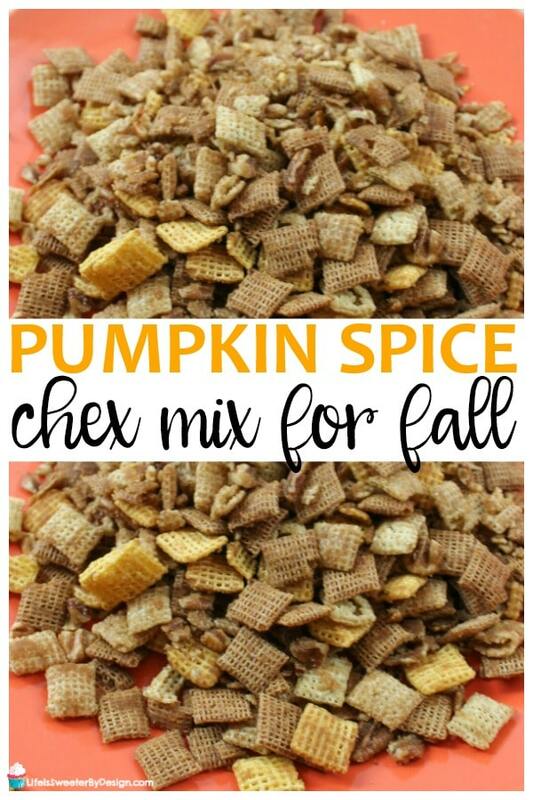 Luckily this Pumpkin Spice Snack Mix is great YEAR ROUND! I love all things fall and it would be really hard to get through the season without eating or drinking something with pumpkin pie spice in it! 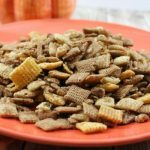 I also LOVE crunchy snacks and it is fun to serve something like this pumpkin spice snack mix during fall festivities. Now…I didn't say this was the healthiest snack….but it is great to have once in a while! First take your large saucepan and add the butter. After the butter is melted go ahead and add the brown sugar and pumpkin pie spice . Stir this mixture to combine. Now it is time to add all of the cereal and pecans to the saucepan. You can leave the pecans out if you don't care for nuts. Stir, stir, stir…just keep stirring this mixture around until it is all coated with some of the butter mixture. It may seem like there isn't enough but the more you stir the more it will coat it all! Lay a big piece of wax or parchment paper on the counter. Dump the whole mixture on the paper and spread it all out. Let this cool well and then store it in an airtight container…if it lasts that long, LOL! Everything is pumpkins right now. I am decorating my porch and that always gets me excited! If you are in the mood for pumpkin, be sure to try this Pumpkin Cheesecake No Churn Ice Cream for a delicious dessert! WOW…it is so good. One of my all time favorite desserts is Pumpkin Praline Dessert and it is really easy to make. This was one of my early recipes…so my images could be better, LOL. You will LOVE this alternative to pumpkin pie. What is your favorite pumpkin recipe? Let me know how you like this pumpkin spice snack mix. Pumpkin Spice Snack Mix is the perfect treat for fall! 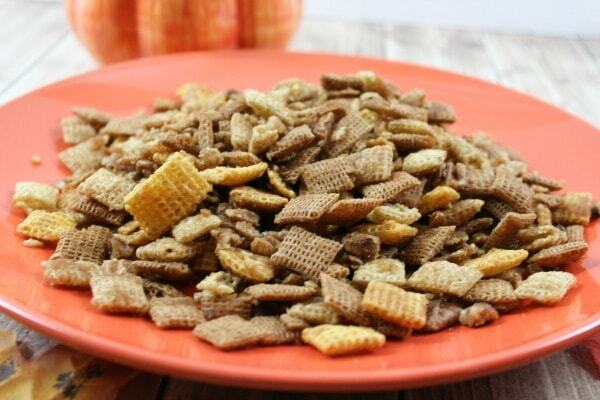 This crunchy snack mix won't last long and is perfect for gifts! Once melted, add the brown sugar and pumpkin pie spice and stir to combine. 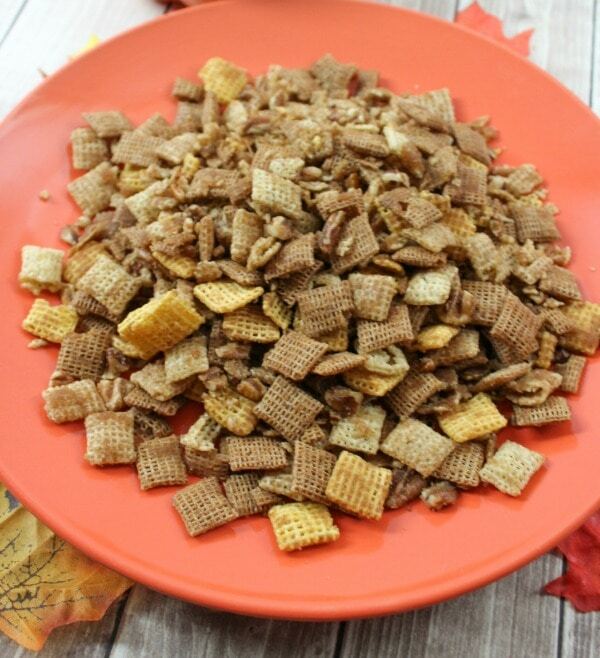 Add all of the cereal and the pecans and mix until the cereal is completely coated with the butter, brown sugar and pumpkin pie spice mixture. Lay a piece of wax paper on a baking sheet and spread out the Pumpkin Spice Chex Mix and let cool before serving! You can always leave the pecans out of this mixture. You can use any type of pecan you like--whole, halves, pieces, etc.